Following the decision on the mid-term (2030) climate and energy framework in 2014, the EU Commission proposed several regulations and directives with a focus on specific areas of action in the recent two years. The most important proposals for reducing the greenhouse gas (GHG) emissions in transport are the Renewable Energy Directive (RED) and the CO2 emission standards for Light Duty Vehicles (cars and vans) and for Heavy Duty Vehicles (trucks). These three legislative decisions will have a huge impact on the fuels (RED) as well as on the future efficiency and drive technology of the vehicles (CO2 emission standards) which will be used for transport by 2030. Even though we follow and comment on all of these three decisions, our main focus is currently on the CO2 emission regulation for cars and vans. Since 2016, we at Oeko-Institut have been evaluating, commenting and making suggestions on how to design this regulation for the post-2020 period as part of our consultancy for the German Federal Ministry of the Environment and the German Environment Agency. In the following weeks, we would like to share some of our thoughts on the proposal of the EU Commission from 8 November 2017 with experts and the general public. Having said this, we want to issue a minor warning. We will write as comprehensible as possible for people who are not experts of this specific regulation, but it will be inevitable to apply technical expressions and more complex descriptions at times. However, let’s start this series on the CO2 regulation of cars and vans with a short intro of the current status of the regulation and the Commission’s proposal from November 2017. The currently valid CO2 emission standard requires carmarkers to comply with an average GHG emission target in g CO2/km for their new vehicle fleet. The first target level for the European new car fleet had been set to 130 g CO2/km from 2015 onwards and will be strengthened in 2020 to 95 g CO2/km. The regulation for vans was introduced a few years after the emission standards for cars and dictates an average emission level of 170 g CO2/km by 2017 and 147 g CO2/km by 2020 for the overall new van fleet within the EU. The specific target values are different for each manufacturer and are based on the average weight of each carmaker’s new vehicle fleet. The higher the carmaker’s average vehicle fleet weight, the higher its manufacturer-specific target value becomes (see Figure 1). Both regulations have several other modalities which have to be considered for compliance, but I only point out one – the enforcement mechanism! There exists a financial penalty for non-compliance with the regulation. The excess premium is 95 Euro per g CO2/km exceedance of the vehicle manufacturer specific target and is multiplied by the number of new vehicles for the year of non-compliance. But no worries, no penalties have had to be paid yet. Compliance is checked through a monitoring database for cars and vans which are created by the European Environment Agency (EEA) for each year. The data of the recent years reveals the carmakers’ strategy (see Figure 2). They have directly aimed the 2020 compliance target and have decreased the GHG emissions of new cars and vans at a constant rate ever since the regulation became effective. A slight dip in reduction velocity occurred in 2016 due to the smaller number of sold diesel cars. This effect will probably continue in 2017 (no final data available yet) and must and likely will be overcome by bringing a higher share of more efficient gasoline (hybrid) and electric vehicles into service. Even though most manufacturers are on track to meet the 2020 target, the ex-post evaluation of the regulation impact revealed major issues with the effectiveness of the regulation in terms of real-world CO2 emission reduction. As with the air pollutant regulation in the past, the CO2 emissions measured during the type approval process are relevant for compliance with the CO2 emission standards. But, the gap between type approval emissions and real-world emissions of new cars has increased since the beginning of the 2000s. In 2016, the real-world emissions were approximately 40 percent higher than the measured emissions on the test bench. Although the regulation caused the emissions from cars and vans to decrease, this widening gap between real-world and type approval emissions has made the regulation far less impactful on GHG emission reduction than expected. In answer to the widening real-world emission gap, a change to the type approval procedure has been discussed and a new test procedure (Worldwide harmonized Light vehicles Test Procedure) has been in place since September 2017. The aim of the WLTP’s introduction is to represent the real-world emissions better than with the old procedure (New European Driving Cycle) and to close the real-world emission gap as far as possible. 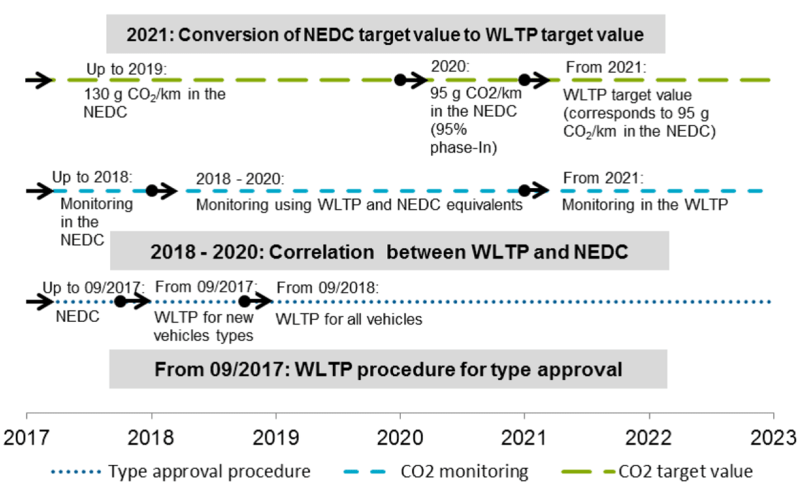 The transition period from emission testing and compliance in the NEDC to a regulation scheme completely based on the WLTP will take place from September 2017 to December 2020 (see Figure 3). In 2021, the NEDC emission target will be translated into a WLTP target value and the NEDC monitoring system will be abandoned. The EU Commission published its proposal for the continuation of the CO2 emission standards for cars and vans on 8 November 2017, with some important changes to the past regulation. The ambition level of future CO2 emission target values is the most important – and usually most discussed – part of the regulation. In contrast to the past regulation, the Commission proposed a relative emission reduction target. 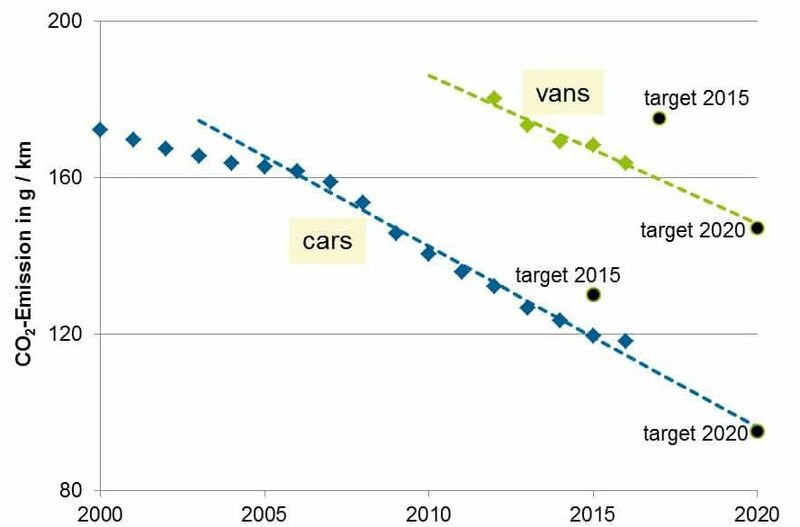 The CO2 emissions of both new cars and new vans are supposed to drop by 15 percent (2025) and 30 percent (2030) compared to the emission targets of 2021. The Commission reasons the switch from a target in absolute emission numbers to a relative target with the insecurities of the impact of the test procedure’s change. As before, the manufacturer’s specific emission targets would be based on the average vehicle mass of each manufacturer (see Figure 1 for the general concept) and the financial penalty in the case of non-compliance would remain at 95 Euro per g CO2/km exceedance of the manufacturer’s specific target. Another interesting issue will be the rising share of vehicles with an alternative drivetrain (especially electric vehicles) in the post-2020 regulation period and the resulting interactions of electric vehicles emissions with those of conventional vehicles. The support mechanism for vehicles below 50 g CO2/km – the so-called super-credits – would be adapted according to the Commission’s proposal. The proposed incentive scheme increases the emission target of a manufacturer by a maximum of 5 percent if the share of new vehicles below 50 g CO2/km exceeds the benchmark of 15 percent (2025) and 30 percent (2030) respectively. This can be interpreted as the continuation of the super-credit supporting mechanism with the requirement to exceed a certain share of low emission vehicles to become effective. the impact of an increasing share of low emission electric vehicles on the rest of the new vehicle fleet. We will discuss and comment on these issues in our upcoming blog posts. We look forward to sharing our insights on this developing topic with you. Peter Kasten is a senior researcher in the Resources and Transport division. He has joined the Institute in 2010 and is leading the work on the interactions between the transport and the electricity sector and is advising the German Ministry of the Environment on light-duty vehicle CO2 emission targets. A phase-in period is considered for compliance. In 2020, only 95 percent of the new car fleet will have to meet the target value. Each vehicle below 50 g CO2/km is granted a super-credit and will be counted as more than one vehicle up until 2022. The Commission proposed a linear weighting factor for vehicles below 50 g CO2/km. A vehicle with 0 g CO2/km counts as one vehicle for the calculation of the low emission vehicle share. 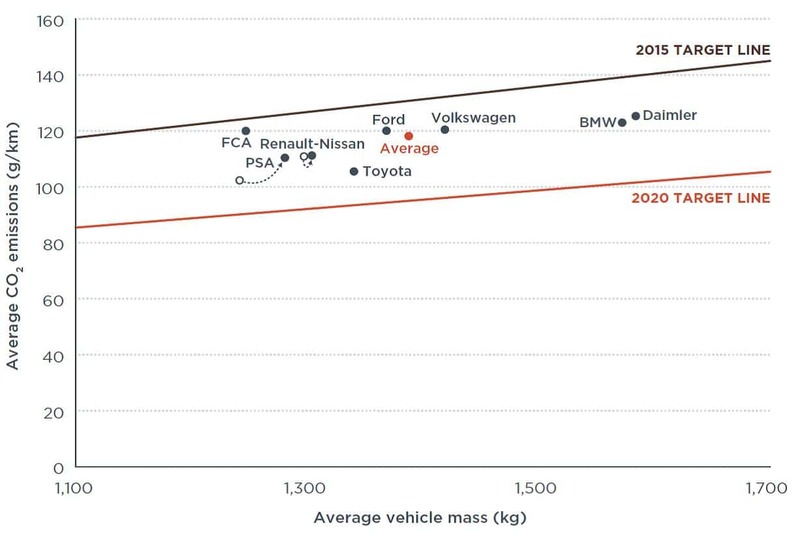 Cars between 1 and 50 g CO2/km count as less than one vehicle and their contribution towards the low emission vehicle share drops in a linear fashion up to the weighting factor 0 for vehicles with 50 g CO2/km. Thank you a lot for this good introduction into the topic!